Common Painting Problems: What is Saponification? Common Painting Problems: What is Corrosion? Common Painting Problems: What are Lap Marks? Common Painting Problems: What is Fading? Common Painting Problems: What is Chalking? Common Painting Problems: What is Flaking? Common Painting Problems: What is Cracking? HONEY GOES HEALTHY, Episode 1: Are Your Daily Habits Healthy? Are the Many Shades of Grey Still Popular for Interiors? Is It Really Your Dream Home? What Trendy Color Palette Do You Need in Your Life Right Now? Quiz: How Will You Celebrate Valentine’s Day? Quiz: Which Color of the Year Are You? 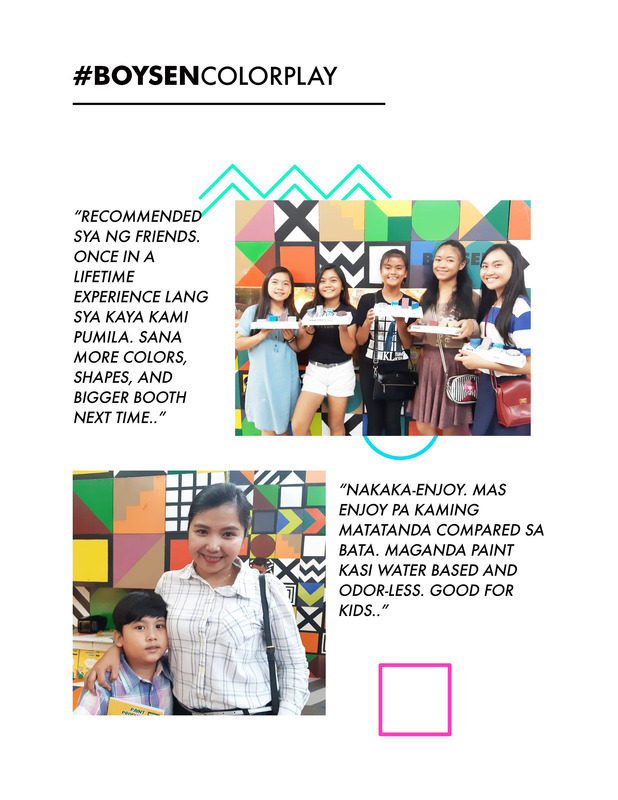 Those instagrammable, multi-colored wooden blocks that make up Boysen’s interactive exhibit called Boysen COLOR PLAY made their debut in the Interior & Design Manila at the SMX Convention Center from March 9 to 11, 2017. 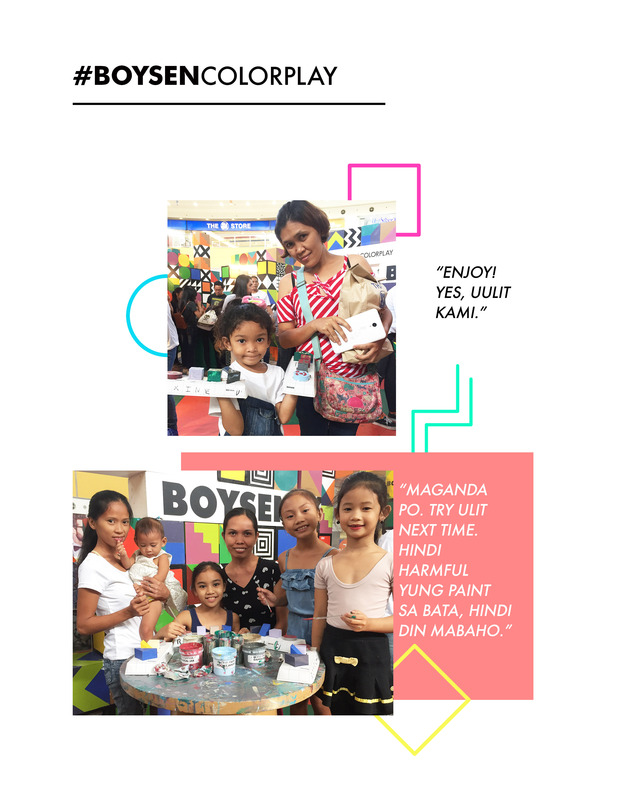 The booth travelled around the Philippines for the many trade shows that Boysen joined last year. But the attraction of the very colorful exhibit and the fun factor it offered the public could not be denied. People just wanted to be part of it, never mind that they had to wait in line to get in. 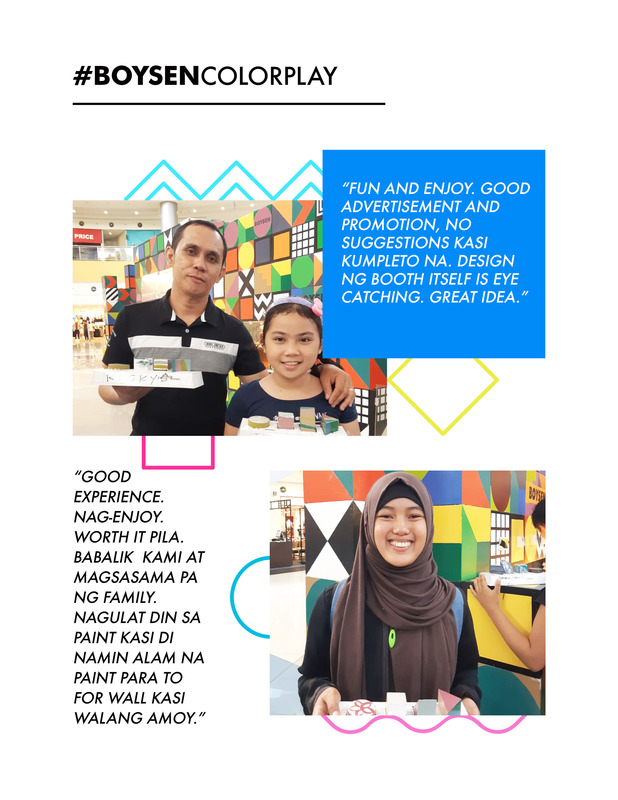 So malls around the country invited Boysen to bring COLOR PLAY and brighten up their halls. 2018 marks the second year that COLOR PLAY has been making its rounds, and the interest is still going strong! The booth is called COLOR PLAY, an apt name for an exhibit that allows people to paint trendy colors on different wooden shapes. It is interactive, fun, and a feast for the eyes. Those who usually visit the exhibit in malls are families and friends who are out for the day. COLOR PLAY allows them to bond and do something creative. People line up for 10 to 15 minutes during peak hours just to have a chance to get in the booth. For families, it is often the children who drag their parents in. But once inside, the parents also have fun. Creative works range from simple to intricate. We even saw blocks painted in uber-cool designs! We’ve got a driven exhibition team whose members are young enough to have the energy to smile and strike a pose even during days when sleep is a luxury. Tense yung team sa first mall activation, hindi pa sanay sa protocol ng mall and dun sa flow ng mga tao na papasok. 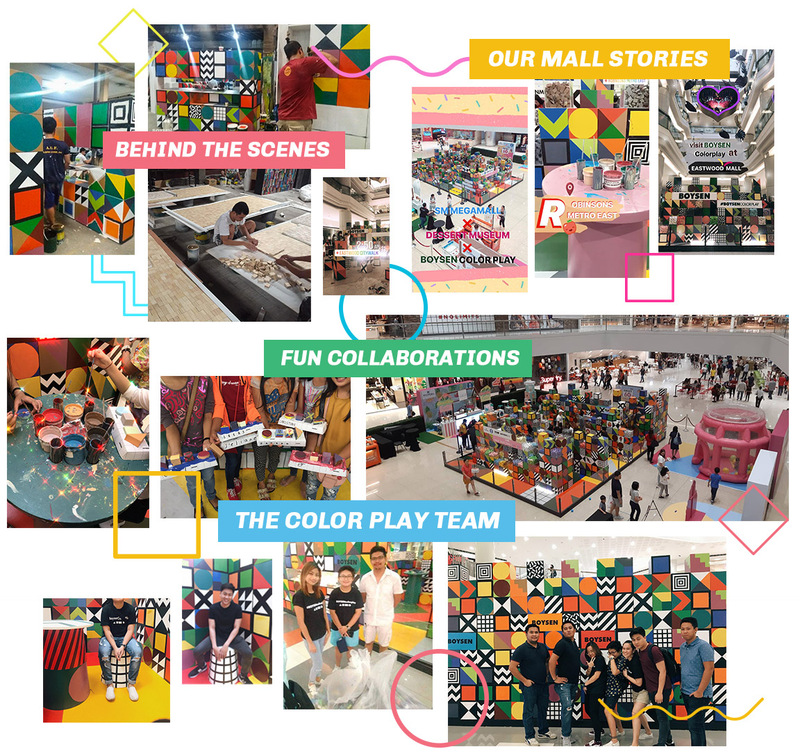 Buong team nag tulungan talaga para maging successful and after nun, dun na nagstart na masundan na ng other malls yung COLOR PLAY. 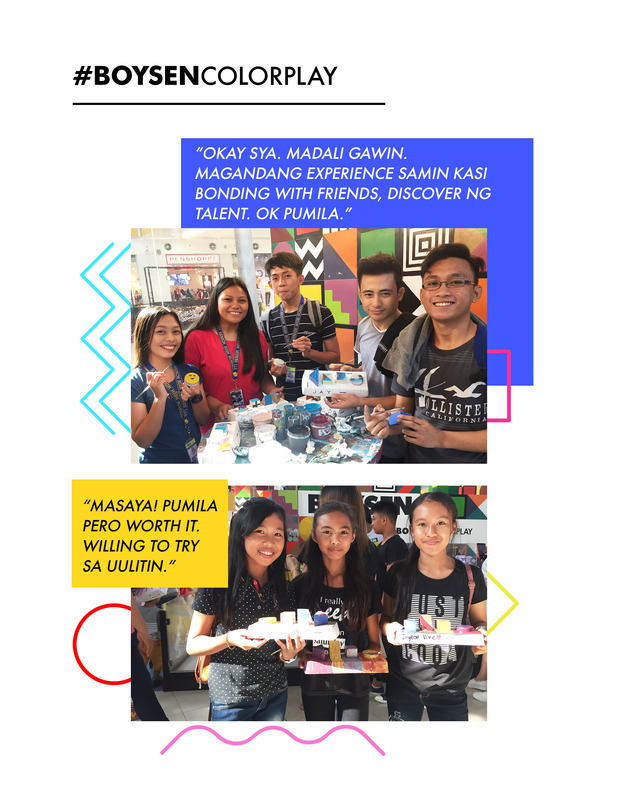 Lahat ng pumapasok sa booth talagang curious sila and laging sinasabi na, ‘Buti nalang nagkaron sa mall, kasi nakita ko lang ‘to meron sa SMX/World Trade.’ Nagkaron ng chance yung ibang tao na maka experience ng COLOR PLAY- not only yung mga nag vivisit sa mga construction shows. I met different people, may mga mababait, easy to deal with. Madaldal, na lahat itatanong at di matatapos hanggat kaya mong sagutin. Makukulit, as in pasaway na kukuha ng madaming blocks. Matataray, kunwari waste of time for them pero papasok naman ng booth. Matatanda na malalambing, na lahat ng pwede ipakisuyo ilalambing, which made me happy and it also made them happy even in a simple way. Tropa (magkakaklase, kaibigan, workmates) na nag-e-enjoy sa libreng activity at group pics. Family, eto yung nakaka touch na feeling (kumpleto at masayang pamilya). It comes as no surprise that a common feedback was that team bonding happens during exhibitions. If you have to work that intensely and deal with thousands of people during an exhibition run, the team becomes even more cohesive so that they can continuously offer visitors a fun experience. For sure, they are very proud of COLOR PLAY and are very happy that the booth gets a lot of visitors wherever they go! If you want to know where COLOR PLAY will be going next, follow our Boysen FB page where announcements are usually made. Annie is an unrepentant workaholic, who runs this blog and her own company Talking Lions. She thrives on collaborating with people who are good at what they do, and working together with them to create something special. 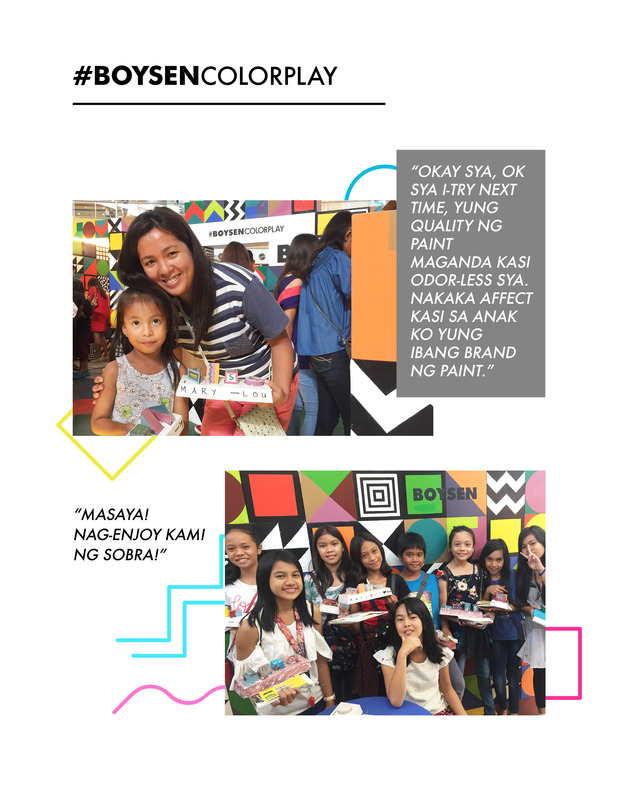 Let it B is the official blog of Boysen, the leader in the Philippine paint industry. Join us to talk about painting tips, home improvements, design, art & culture, and most of all, the wonderful world of colors. Pacific Paint (Boysen) Philippines, Inc. If you want to contribute an article, image or video, email info@myboysen.com. DIY Condo Painting – Should You or Shouldn’t You?